In the photo, some of our products. 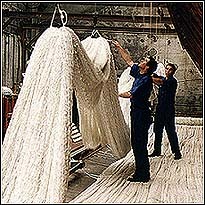 A net making process in our facilities. The progressive and firm growing of Marina Hispánica for 25 years has placed our firm in the leadership of the net making sector all over Spain, apart from being the only one in Galicia. 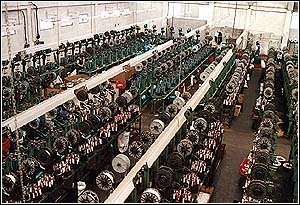 A panoramic view of the weaving mills. 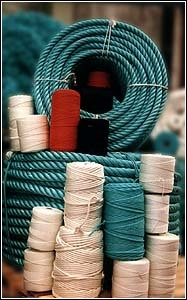 We make our own fishing lines and nets woven in nylon or polythene and with any thickness degree. In relation to the nylon nets, from 8842 to any thickness. A nd in relation to the polythene nets, from 2,5 to 8 millimetres. The modern machinery at our disposal makes us be the fastest and the most efficient firm in the net making.The nylon, or the polythene, go through the weaving machines which turn them into woven nylon. From there, it goes in metallic cylinders, which the winding machines transfix to cardboard cylinders. These last are sold as coils of rope. But the process goes on with the nets. So, we put the reels in the looms, where the woven ropes are knotted and the nets made. Then, they go to the pressure cooker so that the thermofixing phase takes place. This steam tunnel fixes the knots in the net up to more than 100 centigrade degrees. Finally, the only thing to do is to cut the nets according to the asked measures and their sending to the client. 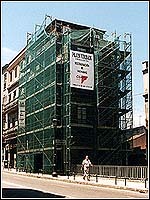 Use of nets in a building being repaired. Our nets are not only used in the fishing sector. The governmental security rules in the building sector make workers use protecting nets in buildings under construction or while being repaired, and Marina Hispánica offers solutions to all this with complete satisfaction.